At some time in your life, you are bound to get those ugly dark circles under your eyes, otherwise known as Raccoon Eyes. Dark circles can be hereditary, or they can develop with age, stress, lack of sleep, and poor eating habits. Regardless, those who have them want to get rid of them — quick! Instead of buying expensive products on the market, try natural remedies. Many of the remedies for dark circles can be created from household products. They are safe, easy, and cheap. Here are 5 that have been recommended on many, many web sites. #1 Almond oil – apply a small amount under the eyes daily and leave it on overnight, washing it off gently in the morning. NOTE: Almond oil is not the same as almond extract which contains alcohol. However, you can safely add a little almond extract to natural oil and get the same results. #2 Cucumbers – cucumbers have often been shown in the movies when a woman is getting a facial. There’s a reason for this. Cucumbers are not only a natural way to lighten the skin, but they also can cleanse the skin of pollution and other nasty things that can change the texture of your skin. 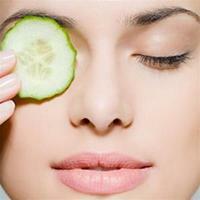 Apply chilled cucumber slices to your eyes daily for about 10 minutes for best results. #3 Lemon juice – the vitamin C in lemon juice is a natural cure for dark circles. Apply lemon juice around the eyes with a cotton ball daily for 10 minutes for best results. #4 Tomato juice – tomato juice has bleaching capabilities. For best results, mix one teaspoon of tomato juice with one-half teaspoon of lemon juice. Apply to the dark circles under your eyes and leave it on for 10 minutes before rinsing. Do this daily. #5 Tea bags – used tea bags, green or black, is very effective on dark circles because of the caffeine and antioxidants. Leave a chilled bag over each eye daily for about 10 minutes before washing. You can even do this twice a day. Always remember that the skin around the eyes is thin and delicate, so whatever you use to treat dark circles, use it gently.